Powerlifter Yolanda Presswood was left with mixed emotions following her recent record-breaking powerlifting meet. The Californian vegan felt the opportunities to warm up were limited and was surprised to see her squat questioned for depth on several occasions. Despite this, she still managed to break some records and go home with some metalware. "I had been dealing with some mental aspects of life occurrences a few weeks out," she told Great Vegan Athletes soon afterwards. “Although I had added 32.5lbs to my squat in training and had benched more weight than my state record for easy pause reps.
"I went into this meet feeling less confident than I had in October." Considering the mental aspect as the State Championships approached, Presswood reflected that 'the amount of mental fortitude necessary to move two-times body weight is huge' and took some extra rest days and her coach altered her taper. The high standards she sets herself are usually achieved due to determination and commitment. "I do have days where I ride the struggle bus as we call it," she says. "When push comes to shove, I bring what’s necessary to succeed." Recording a 308 lb (140 kg) total after some issues was disappointing as she had higher hopes and was confident of squatting more. In hindsight, Presswood feels she didn’t warm up properly. She was called to the platform earlier than she expected. She also feels she made a mistake in failing to use her full time to lift, and not being warmer as a result. Her first lift was disqualified for depth, and this disrupted her plans. After completing a 308lb lift Presswood had the opportunity to take a fourth lift to break again the state and national record, although again the depth of the squat was questioned and the lift did not count. This was mentally devastating and Presswood was left feeling her recent months of hard work had been wasted. She was much more happy with her bench of 143 lb (65 kg), although she felt her technique on the third attempt could have beaten this. 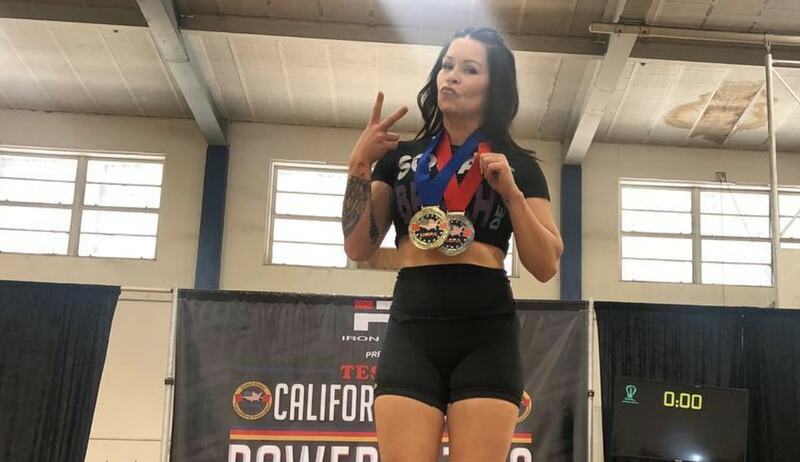 "Deadlift went fine," she says – and she took a personal record of 325.18lbs (147.5 kg) She went on to attempt the State record which came off the floor but not to a full lift. "My biggest aspiration for today was to podium in open among the 20 year olds and lifters weighing 10+ more lbs than me. "I would have been happy sliding into third." She took silver in the open despite being the oldest and lightest lifter - at 41 she was competing against lifters in their 20s. At 62.5kg she was light in the 67.5 kg category. She also set a California record for squat and bench – and for the total of 777 lbs (352.5 kg) in a competition. The squat was also an American national record. She took Gold in her veteran’s (age 40-44) category. Her competition total personal record was pushed up 43 lb (19.5 kg). Presswood was disappointed over missing the elite total, but feels she clearly has more to offer. That she should break a national record for squat and still feel that she has not reached her potential speaks volumes about the potential she had, and the determination she has to reach those levels. "I’m still crushed about my squats," she says. "I also did not get the international elite I was after because of it." She’s already considering competing at the Anaheim Fit Expo later this year. "I’m definitely just getting started," she says with determination. "I’m a baby in the powerlifting community still having only been present for just over a year."